On 9 November 1951, Hubbard sent a handwritten letter from Wichita to the Heinleins at their home in Colorado Springs, Colorado. Hubbard said he was almost at the Heinleins’ front door the week before, but couldn’t stop. He added that “I’m up to some shenanigans near you” and said he would be in the area. Federal investigators disclosed Saturday that a mysterious organization–with the announced purpose of enrolling scientists and protesting use of the atom bomb–suddenly closed its Denver office this month after a brief cloak-and-dagger existence. The organization was known as Allied Scientists of the World; also the Alliance. Its activities first came to the attention of investigating agencies in late November and early December, when protests suddenly started pouring in from scientists, engineers and architects in all parts of the United States. 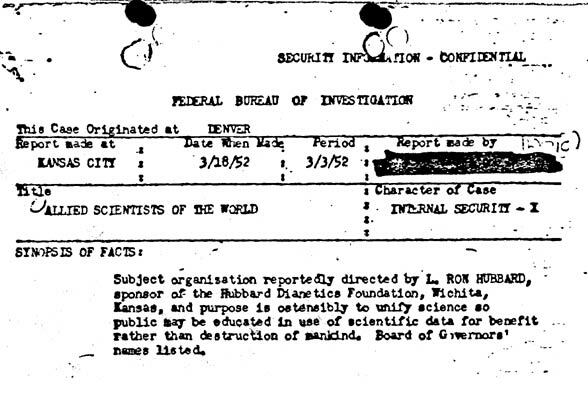 The protesting scientists and technicians, many of them working on top secret government projects, said they had received identical letters from Denver–the “Communications Office, America” of the Alliance–in which they were complimented for scientific achievement and told they had been awarded fellowships in the organization. They were asked to submit $25 for a year’s dues. The letters were signed “Agnes Dobson,” who was identified as secretary of the Alliance’s board of regents. Investigators have not been able to find a trace of such a person. Accompanying literature explained the purpose was to band scientists together to protest use of atomic energy–today’s major U.S. weapon–in any future war. Also the organization announced it planned to compile and build an atomproof library of vital scientific information, and to take a hand in the government’s plans for civil defense. Solicited scientists were told the organization, once it got going full steam, would be turned over to the United Nations. Other investigators–including representatives of the Better Business bureau and financial agencies–visited the office at 941 East Seventeenth avenue in Denver but found only office help who could give little information. of Wichita, Kan., a firm which trains laymen to practice what the foundation describes as a new science of mental health. The foundation is headed by L. Ron Hubbard, well-known science fiction writer. It is further reported that [Hubbard] has been previously committed to a mental hospital. On June 12, 1955, the above-captioned individual, accompanied by his son, stopped at the Bureau and inquired if any information could be furnished him concerning the Academy of Scientology, 1812 19th St., Northwest, Washington, D. C., or its founder L. Ron Hubbard. […] explained considerable literature about the Academy is being disseminated in Alaska and said inquiries have been made of the State Police regarding the Academy. He explained that a member of the Metropolitan Police Department, Washington, D. C., told him that the Academy is one of the worst legal frauds that Department has ever encountered. During March, 1951, the Board of Medical Examiners, State of New Jersey, had a case against the HDRF scheduled for trial on the grounds that the organization was conducting a school, teaching a branch of medicine and surgery, without a license.